You're here: Home » Is Your Data Taking the 5th? Is Your Data Taking the 5th? Some businesses struggle with the basics of social media analytics — getting past measuring likes, follows, RT. Meanwhile, leading firms moved well past these descriptive analytics — and even more substantial statistics that help optimize post times and determine where leads come from. Leading firms use predictive statistics to go beyond what worked, to help decide with will work. Unless we can make our data talk, we can’t discover actionable insights to improve performance. The days of relying on manual processes to collect and analyze descriptive statistics are gone; replaced by more sophisticated efforts to predict what WILL happen rather than simply understanding what DID happen. Making data talk isn’t easy. It relies on systematic data collection in real-time, translating data into meaningful insights with predictive analytics, and data visualizations that reduce mountains of data into pretty pictures to ease interpretation. What is the secret to making data talk? Despite these problems, firms using advanced analytics get a 5-6% increase in productivity over those who don’t — a result that dwarfs the problems involved with using them. Putting together the right team is essential for making data talk. 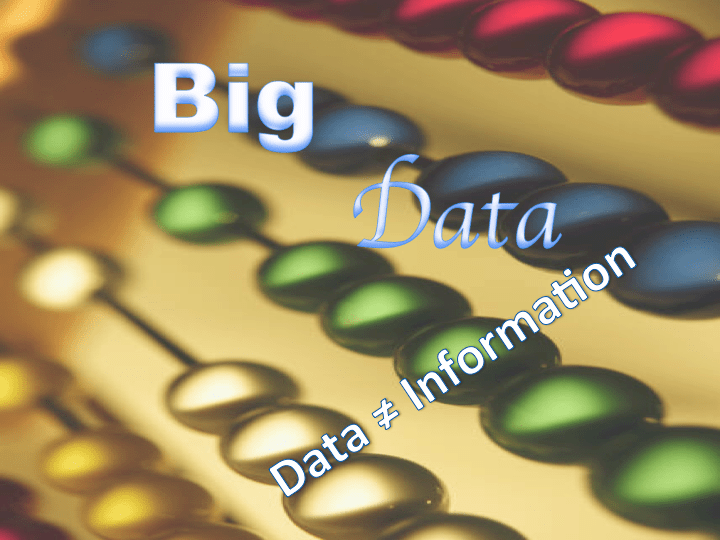 BI requires analysts schooled in sophisticated business modeling using tools such as Modeler, SPSS, SAS, Hadoop and other tools designed to handle “big data”. Recognize, making data talk is part art and part science. Thus, your team shouldn’t just be geeky and smart, they need to understand how people think — much like in the new hit series Scorpion need Paige to interpret the world around them despite the others in their high IQ team. Plus, there’s an art to understanding (and predicting) the needs of internal users and creating reports they can understand. And, these tools change all the time, so investing in ongoing training is a must. Modern social media monitoring and analysis demands a disciplined, scientific approach, rather than a non-scalable, miscategorised overview of online opinions. Social media is now sufficiently mature and pervasive that the only sensible approach is to develop quantitative analysis methods with teams of mathematicians, social scientists and statisticians; applying statistical theories and unique algorithms to analyse huge volumes of unstructured text. You’ll benefit most from systematically implementing a scientific methodology that moves from mere social listening to social intelligence. This means analysing the content of the social landscape, respectfully extracting meaning from public conversations, and making actionable sense of what is being said. Making data talk requires the right processes for collecting “clean” data. And, that’s hard. I once visited a client to help them understand why profits were shrinking. As I waited for my appointment, I saw employees in their inbound call center collecting orders on paper forms with their computers pushed to the forward edge of their desks. We’d implemented a EDI system the month before, so I couldn’t understand why employees continued to use paper. We’d done everything right. We got buy-in from employees, we trained them, and worked together for awhile answering any questions. We hoped over to the inbound call center to ask employees why they still used the paper forms. We’re afraid the orders will get lost in the computer, then we’ll have no record. This way, we enter the order into the computer in the evening and have a paper backup in case something happens to the computer. Wow, this just goes to show how hard it is to break old habits in an organization. Another client stopped efforts to introduce advanced activity-based costing software because his older employees just couldn’t get the hang of the computers. Unfreezing problems occur when departments become territorial about their data –refusing to share it with the rest of the organization. It’s not enough to make data talk — you need to get accurate insights not nonsense. Underpinning most predictive analytics are relationships among your data. Some of these make sense, like the relationship between age and income (in general, our income rises as we get older). Some data relationships provide meaningful insights, so a relationship between # of years as a customer and AOV (average order value) create opportunities. Some data relationships are simple nonsense, such as buying a ballet shoe and a fishing pole. Does this mean there are a lot of fishing ballerinas out there? More likely the individual purchased 1 or both products as gifts for someone else. We call these spurious correlations and they’re dangerous. Planning based on spurious correlations is likely to fail. Many organizations still organize around function — operations, marketing, finance … While modern management theory suggests these organizational structures don’t work very well, they’re deadly when it comes to making data talk. Not only does data get embargoed within the functional group so others don’t even know it exists, but functional thinking pervades the organization making it hard for everyone to think about how x is related to y. Organizations are like ecosystems — every area contributes to the success or failure of every other area. They depend on each other. For instance, social media isn’t just a communication channel, it’s the source of consumer insights. When Mark, from Microsoft, noticed comments surfacing about the Surface computer right after it launched, he shared insights with the operations groups working on the next iteration of the Surface so they could enhance its user experience. Forbes demonstrates how a telecommunications company combined big data across all marketing channels — social and traditional media spends with sales and customer use data across social platforms to build a model quantifying the impact of their marketing spend. Results showed the importance of customer engagement with the firm’s call center — which performed poorly in the eyes of customers. By shifting spend from traditional media to improve call center performance, the firm improved customer sentiment and increased revenue by millions of dollars. The key to using big data is to keep it simple — and manageable. Tahari, the women’s clothing company, found the benefit of KISS (keep it simple, stupid) early in their BI journey. Using visualizations to summarize a 200 page report brought actionable insights to managers who failed to find the same kernels in the longer report. After building a predictive model based on 3 years of sales data, managers better predict which sizes and styles will sell to a given retail store and how a retail sale impacts demand from their retail buyers. Armed with this knowledge, the company does far less air shipping (at 3X the cost) and more shipping by boat from their manufacturing sourced in the far east. Yesterday, I went to an analytics roundtable organized by IBM, which prompted this post. They obviously touted their own tools, but a number of companies make products that create similar insights for your business. In fact, Predictive Analytics Today curated a list of the top 21 brands, including not only IBM, but SAP, SAS, Oracle. We welcome the opportunity to show you how we can make your marketing SIZZLE. Sign up for our FREE newsletter, get the 1st chapter of our book – FREE, or contact us for more information on hiring us. Hausman and Associates, the publisher of Hausman Marketing Letter, is a full service marketing firm operating at the intersection of marketing and social media.